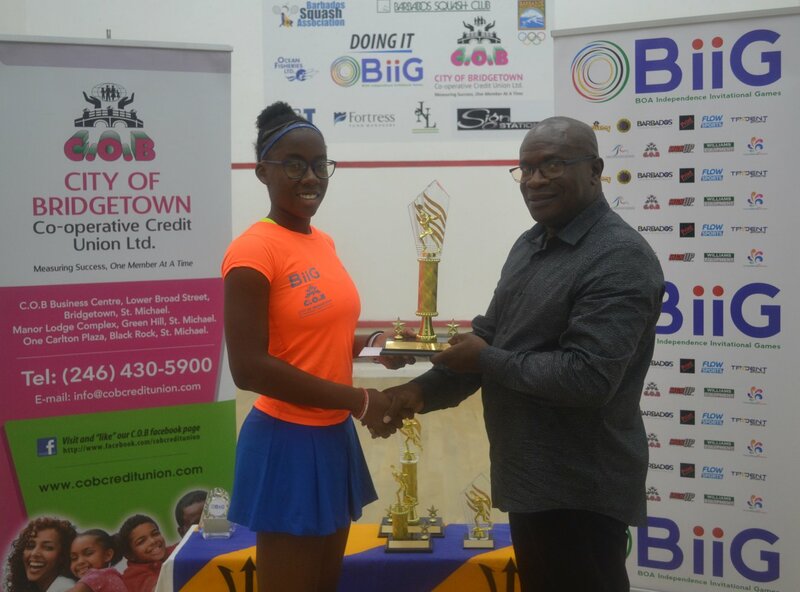 Shawn Simpson and Jada Smith-Padmore were crowned the Champions of the 2018 BiiG C.O.B Squash Open after an exciting four days of exciting competition. 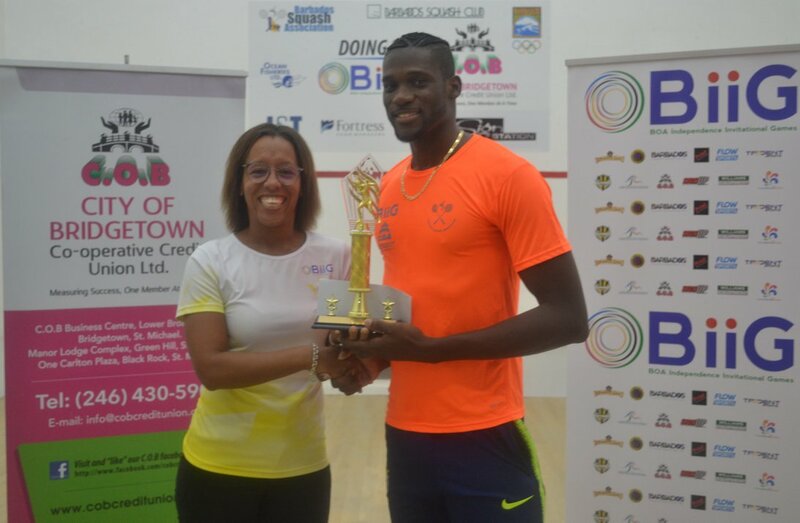 In the men’s final #1 Shawn Simpson (BAR) played against Jules Snaggs (SVG). While Simpson's powerful style of play was maintained throughout the match, Snaggs graceful style of play yet at times powerful allowed him to stay close to Simpson in the first game which ended 11-8 to Simpson. Game 2 saw a change in tactics from Snaggs where placement and a slower pace was used against Simpson. This allowed Snaggs to gather some points which allowed for a 10 all score in the game. But Simpson would soon recognize the strategy and Snaggs in a rush to win the game would make errors which allowed Simpson to surge ahead 2-0. Trying to play catch up Snaggs continued his fine style of playing trying not to let the lanky yet powerful Simpson get too far ahead of him. But poor shot selection by Snaggs would allow Simpson to clinch the match with an 11-8 triumph in the third game. 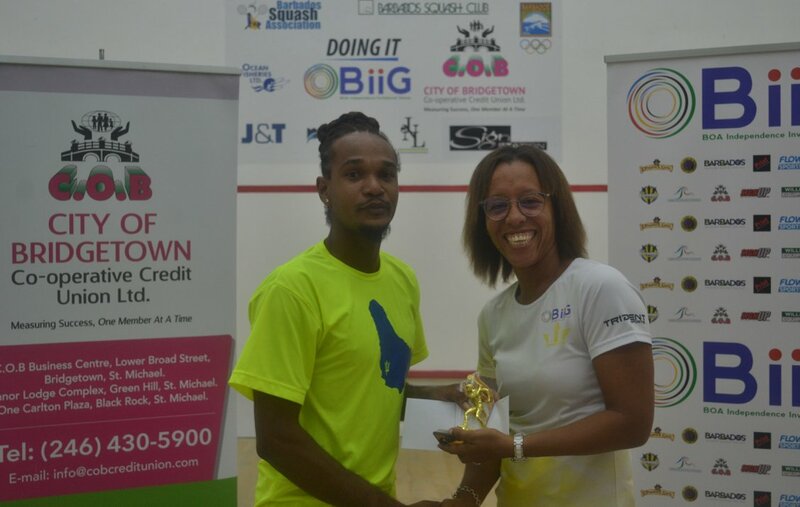 Simpson would raise the trophy as the 2018 BiiG COB Squash Open Male Champion. 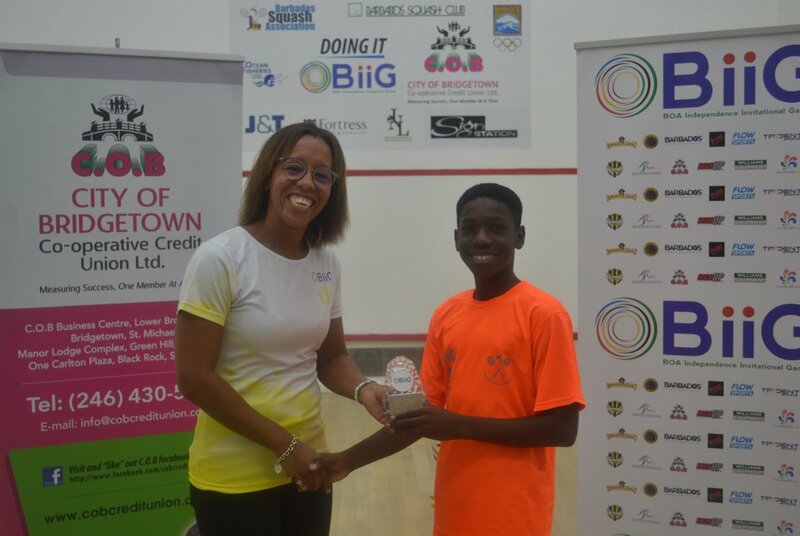 Third place playoffs matchup saw Rhett Cumberbatch (BAR) and Stewart St John playing a great match with St John losing to Cumberbatch 3-0. 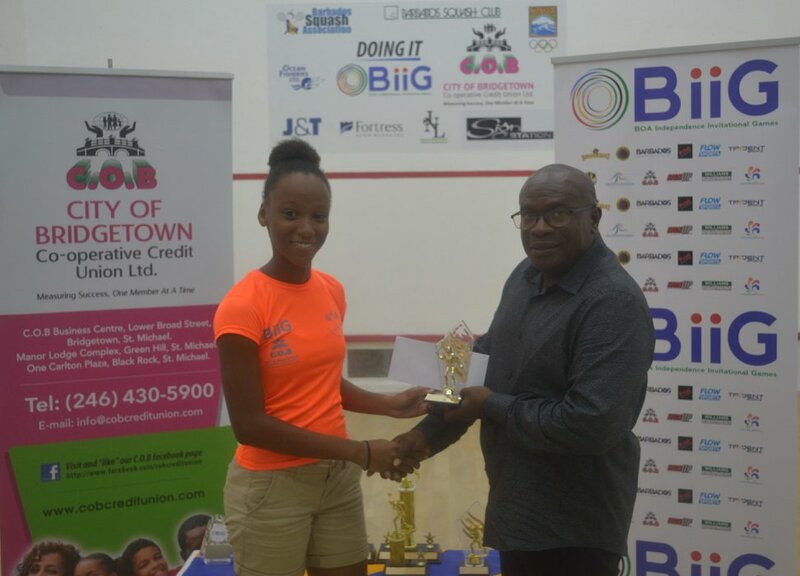 Third place in the Ladies was played previously on the third day and won by Jodi Smith-Padmore in her play-off against runner-up Sumairaa Suleman in a match that was indeed a pleasure to watch as the determination and shot selection on display resulted in them going to 5 games. 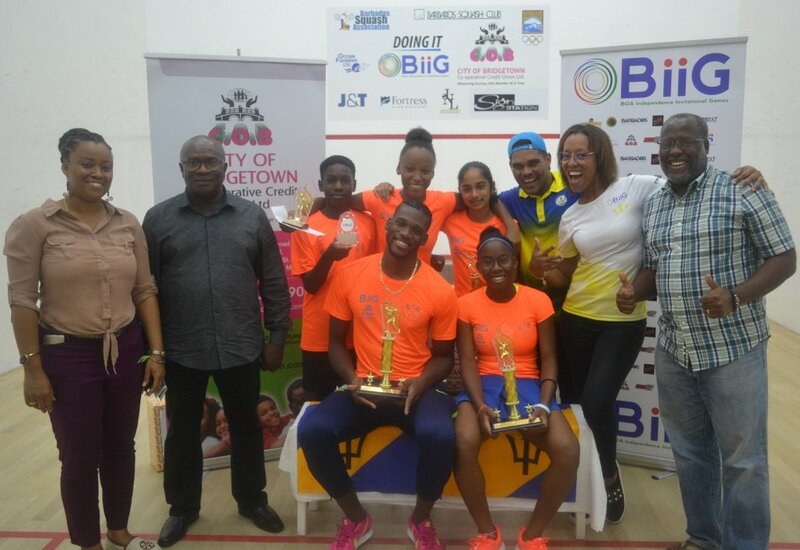 As parents, peers and supporters watched the fine display of talent on the courts both players showed why Barbados squash is a force to reckon with. 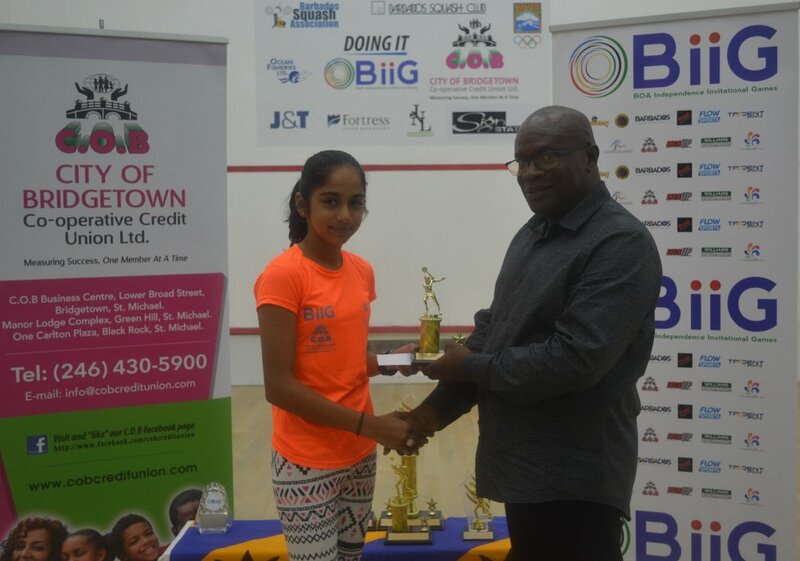 Suleman would triumph over Smith-Padmore winning 11-7, 7-11, 5-11, 12-10, 13-11. 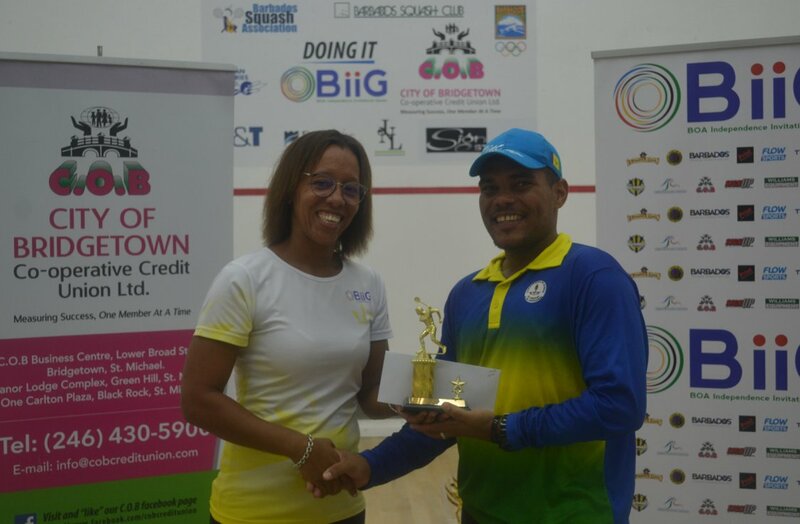 There was also excitement i the classic plate (5th place playoff) final when Mark Sealy (BAR) and Kevin Bailey (SVG) had the crowd at the edge of their seats gasping at the shot making and athleticism on display. Bailey eventually would triumph over Sealy 11-9, 3-11, 11-6, 14-11, 12-10. Darien Benn (BAR) went against Stuart Tippleston(ENG) in a match which saw Benn displaying some great stroke selection, which at times had Tippleston not having a response. The David and Goliath display would end with Benn dispatching of Tippleston 11- 3, 11- 7, 11- 4 to win the Plate final.